Whimsical items like this are always fun. First, build a wish list. Research your topics of interest on the internet and try to find informative articles and knowledgeable people to help you learn some of the basics. Make a favorite plant list and visit our Plant Pictures page to see some of our favorites. Gathering magazine and brochure pictures or your own pictures will help you communicate your ideas to your contractor. Visit the web-sites for patio pavers & retaining wall products we link to from our Paver patio or Retaining walls page. They have design ideas with endless options of color texture etc. and installation guides you may find informative. A visit to the www.atlantabotanicalgarden.org or www.callawaygardens.com is another fun way to develop your favorite plant list and gather hardscape ideas. Visit at dusk for lighting cues. Visit our Landscape Lighting page to find links to outdoor lighting manufacturers. Finally, keep a list of product names and where to buy them. Your research will turn up some really unique items you may want later. The perfect patio chair, an engraved memorial bench for Fido, or solar butterflies to add color to your nightscape to name a few. By this point in the process, you probably have a good idea of what you want. 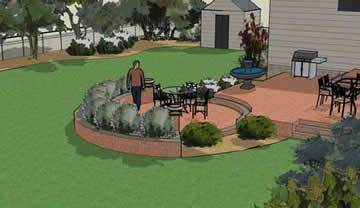 If you are having difficulty visualizing your project, consider a landscape design. A design helps blend your plant list and all the hardscape elements on your wish list. A scaled sketch like this one may be enough for a small, confined project. A different option is a 3-D plan like this one. Belgards “design studio” can create 3-D designs from digital pictures you send to them with sketches and other details. This option is primarily a hardscape design tool but will show a few plants. Plans ranges from $99-$300. 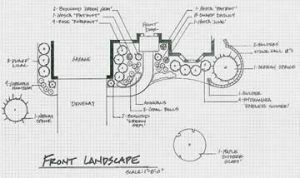 Full landscape blue prints from a registered landscape architect can get very costly at $100/hr but can also simplify the bidding process greatly for large projects. Be prepared to spend $1000 or more for a comprehensive blue print that includes all landscape and hardscape items and material lists. I recommend contracting with an architect first and independently. Several contractors in our area use this step to “rope you in”. With “your” plan in hand, you can begin looking at several contractors and choose the one that best suits your needs. Have you heard the quote “trust but verify”? Better Business Bureau performs back ground checks on all members and rates them. Kudzu is either a free or paid listing for business but reviews are posted by customers. Angies list is a membership based service where only members can post reviews. Contractors cannot pay to be listed there. You will need to search by company name to get reviews on a particular company quickly. To find a local contractor, look in our local rotary club book or visit them on-line @ http://www.rotaryphonebook.com/. Provide each selected company with the same materials; your wish list, and all the gathered materials from the planning stage. During your meeting with each, ask your self a few questions. How well do they listen to your ideas? Do they have ideas that complement yours? Draw from their knowledge and experience. Do they offer suggestions without being forceful? A professional should take time to listen, explain your options, then offer advise. Which one seems to be a “good fit”? When a problem arises, who will be easier to get along with and work through the problem? Think about it this way. You are hiring an employee. You need to interview them. What separates them from the next contractor? How much of the work will be performed by sub-contractors? How often will they inspect the job if they are not personally performing the work? Are permits required for the project & who will be applying for them? Who will be the on- site supervisor during the job? How long do they guarantee workmanship and materials ? How many projects like yours have they completed? Ask for & check references! Will the installation meet all current building codes? Who will be responsible for securing the permits? The most important component of your project is receiving true value in what you have purchased. “He who controls the money, controls the job.” Every project should be “contracted”. You need a complete description of what work will be performed, where and for how much. The warranty should be included in the contract. Get it in writing and get it signed. Have a clear understanding of how and when payments will be released. Be sure the contract includes a clause that states that you the homeowner are not responsible for payment disputes between the contractor and sub-contractors as long the homeowner is not in default of payment. Never make a final payment until the job is complete. Many contractors require a starting deposit to validate the contract. This is a common practice due to many materials being non-returnable or perishable. Simply following these steps does not guarantee a trouble free experience. Challenges and changes will occur. Be flexible. Following these suggestions will weed out scoundrels and persons of questionable character. Respect in the community is every good contractors goal so the good ones will help you through the surprises that arise. There are many contractors to choose from. Take your time and plan your project carefully. Consider, tackling your project in the off season when possible. Spring and early summer has always been a busy season. Your project may receive more focus from your contractor from October through February. Another option is to implement your plan one step at a time. 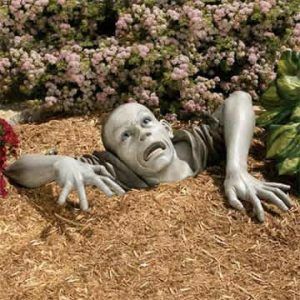 Hardscaping, drainage, irrigation and outdoor lighting can be built anytime of the year. Container grown plants and trees should be planted in the off season to give the roots a head start on our hot & dry summer days.